When it comes to planting fall garlic, timing can be everything. First, when you receive your garlic bulbs, do NOT separate them until just before you put them in the ground. Put them in a dark, cool spot until planting if you cannot plant them fairly quickly, so as to prevent premature sprouting. Separating the bulbs from the clove prematurely will allow the root nodules to dry out, meaning it will take longer for the bulbs to set roots. Garlic, a remarkably hardy root vegetable, in most cases, will perform much better when subjected to severe winter conditions. In fact, many varieties prove to be the most flavorful following a harsh winter. So, the trick is to plant early enough for the seeds (cloves/sets) to establish a good root system, but not so early that the plants have time to send up mature shoots before the onset of winter halts growth completely. A little above ground growth won’t hurt, but you definitely don’t want the formation of bulbs to start. The experts suggest planting your garlic seeds 4 to 6 weeks prior to the time the first hard freeze is expected in your area. The soil where you plant your garlic sets should be loosened and well-prepared, with compost or organic material worked in to provide the suitable nutrition and to give your fall-planted garlic a healthy start. The root end of each garlic clove that is attached to the bulb should be planted facing down, about 4 to 8 inches apart and 2 to 3 inches deep. Garlic seeds planted closer together will produce smaller bulbs in greater numbers, while those planted farther apart will produce fewer bulbs but with larger cloves. Once the ground freezes, cover the entire bed with 3 to 4 inches of leaves or hay, avoiding straw, as mites found in straw can attack the garlic. This will conserve moisture, provide insulation and control weed growth until spring arrives. You just wait. Sit in front of the fire, make snowmen with the kids, indulge in evenings with hot cocoa and good moviesand just when you think winter couldn’t last any longer, spring will arrive and you will already have done all the hard part when it comes to your garlic crop. 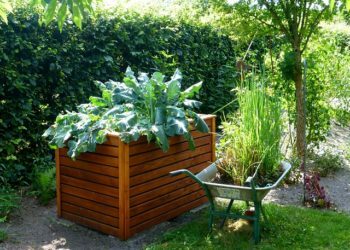 Now you just gently rake the leaves or straw off the new sprouts popping up; apply some organic fertilizer and harvest when ready! In wetter areas, you may not want to mulch at all throughout the season, but if it dries out, re-mulching will help to conserve moisture, control weed growth and moderate soil temperatures. Garlic does not appreciate competition in the form of weeds or grass, nor does it care for hot summer temperatures, so adapt these suggestions as needed for your particular area. As for wateringgarlic requires somewhat even moisture throughout the season, though it is better to let it dry out some during the last few weeks prior to harvesting. Not enough watering will result in undersized bulbs, while too much watering affects the storage quality of the bulbs, greatly shortening garlic’s shelf life. It is better to stop watering earlier than to overwater later. When Can I and How Do I Harvest? The time to harvest will vary, depending upon your zone and the growing conditions of any particular season. The only sure way to know is to regularly check the bulbs, feeling for the bumps of the cloves through the wrappers of the mature bulbs. Most gardeners will harvest starting in July, with the lion’s share being harvested in mid- to late August. This is one crop with no set times; your experience, and trial and error, are the best gauges. Amazingly, garlic does bruise kind of easily, so be careful when harvesting. We suggest a fairly flat, narrow-bladed shovel to loosen the soil around the plants, and then lift the plants by hand. If harvesting on a sunny day, the bulbs can actually become sunburned, with some varieties changing flavor in the sun. 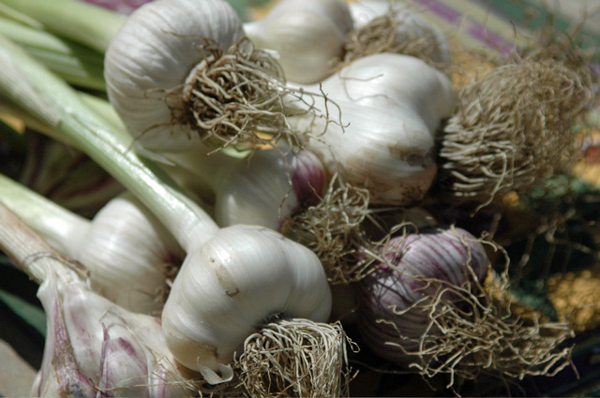 Move your garlic bulbs to a cooler location, out of direct sunlight as you harvest. If you’ve harvested young or new season, immature garlic, you will want to store it in the refrigerator and use it within a week or so. These cloves will normally have a more subtle flavor and can be used just as you would leeks or onions. For mature garlic, you will want to dry it well, after washing the bulbs and roots. You can hang the bulbs from their stalks if you wish. The area should be dry, shady and well-ventilated, the drying process taking in excess of a week, but enabling you to store it for an extended period. Okay, NOW you can enjoy! I’ve planted my garlic according to the planting-time “map” furnished by U. Maine. Alas!! The shoots have already come up! about 6-8 inches high. First snow came last night (Nov. 7, ’12). Have I lost my crop? Anything I can do now? David, congratulations on your garlic crop! What you need to do is cover the plants with 6-10 inches of straw. In the spring, you can uncover them.